COPE Releases Full Election Platform. Vancouver Can Count On COPE. COPE released their full election platform this morning at SFU’s Harbour Centre. City Council candidate RJ Aquino, along with Park Board candidate, Donalda Greenwell-Baker, and School Board candidate, Jane Bouey, outlined the party’s plans to create a Vancouver for everyone. Their comprehensive platform spoke to a number of issues ranging from transit, housing affordability and the economy, to democracy, justice, the arts, schools and parks. Some highlights included their plans to tackle housing affordability through the creation of a City Housing Authority, an arms-length authority charged with making affordable home ownership a reality. The party also emphasized the need to support small, local businesses through a tiered business taxation system. Finally, they advocated for electoral reform and changes to elections spending. “COPE also wants to see big money taken out of Vancouver politics by limiting election spending and donations,” said Aquino. Park Board candidate Donalda Greenwell-Baker highlighted COPE’s opposition to park service fee increases and called for more public washrooms around the City. “Parks and recreation facilities are community hubs that foster connections among Vancouver residents. COPE is opposed to fee increases for services, unless used to create a more sustainable option, and is committed to keeping our parks and services accessible to everyone,” said Greenwell-Baker. Jane Bouey, School board candidate running for re-election, stated: “COPE will support and advocate for a strong, public school system that meets the needs of every child. This means smaller class sizes, support for children with special needs and more English as a second language instruction.” She also underlined the need to keep Vancouver kids safe and healthy through seismic upgrades and an emphasis on environmental sustainability. Vancouver – COPE’s ‘neighbourhood’s first’ philosophy is being exemplified in their most recent platform announcement: the creation of Vancouver neighbourhood councils. The party is looking to bring democracy back to the grassroots level by supporting local area councils to represent each Vancouver neighbourhood. “Nobody knows what’s best for a given community better than the people who actually live there. Let’s let them have a say in how their communities develop,” said COPE City Council candidate, RJ Aquino. Modeled after advisory boards such as the Urban Design Panel and the Vancouver Food Policy Council, the boards would advise the city on matters regarding their respective communities. The councils would be given input on rezoning applications and development proposals, and their signature of approval would be important for project validation. “This initiative has the potential to change the face of city planning and local politics – empowering communities to play a leading role in helping shape their neighbourhoods,” said COPE City Council candidate, Ellen Woodsworth. “You can count on COPE to put neighbourhoods first by allowing them to decide what their communities look like, what direction they move and how they develop over time, ” added COPE Park Board candidate and former president of the West End Residents Association (WERA), Brent Granby. Candidates will be available for follow-up interviews and comments throughout the afternoon. Vancouver – Unlike most Vancouver green space, Hastings Park is not governed by the Park Board. COPE Park Board Candidates Donalda-Greenwell Baker and Brent Granby want to see this changed, and called today for the governance of Hastings Park to be moved under Park Board jurisdiction. As it stands, Hasting Park is governed by the PNE board, a private, closed, corporate board responsible to the PNE Corporation and not to the public. COPE emphasized however, that although they would like to see the governance of the park be transferred to the Park Board, they do not want to see any jobs be lost in the process. Vancouver – COPE candidates Ellen Woodsworth, Brent Granby, Gwen Giesbrecht and Al Blakey will be finding out which is the fastest way to get around Vancouver in the Vancouver Area Cycling Coalition’s ‘Share the Road Challenge’. The candidates will each be using one method of transportation – car, bike and bus – to race (respecting road rules, of course) to the Vancouver Public Library, during morning rush hour. COPE and the other teams will compete to see which is the fastest method of transport. The Candidates will be arriving at the finish line, between 9:00 – 9:45am. Speeches and photo opportunities will take place at the finish line – the Northwest plaza of the Vancouver Public Library’s central branch. Vancouver – As bicycling becomes an ever-popular mode of transportation for many Vancouverites, the question of road sharing, or sidewalk sharing, as it may be, is becoming increasingly important. The City of Vancouver is currently working on a 10-year cycling master plan to be incorporated into their Transportation Plan 2040 – a longer ranging vision of the City’s future transportation development. “COPE will ensure that bike safety education, increased cycling infrastructure and better by-law enforcement, are included in the master plan, so that we can create a Vancouver that is accessible to everyone,” said COPE City Council Candidate Tim Louis. In March, 2011 the City of New Westminster committed to funding the Vancouver Area Cycling Coalition’s Ride the Road program for all grade 7 and 8 students. COPE is also calling on the City of Vancouver to pressure ICBC to include substantial training for new drivers on how to respectfully share the road with drivers. Wear purple to stand in solidarity and show support to those struggling every day through homophobia. This event takes place everywhere. All you have to do is throw on a purple shirt, tie up a purple tie, wear some purple shoes.. Just put some on yourself, somewhere. The vigil is to remember the youth who took their own lives due to homophobic bullying and to show people that IT GETS BETTER. in our institutions and particularly in our schools. have chance to mature and be happy. The Park Board will be installing an accessible automated public toilet unit in Nelson Park in the coming months. You are invited to an information session to view the design and location and to ask questions of Park Board staff. Vote on November 19, 2011. Lets make voting the majority. With the emergence of new tools like smart phones there will be new ways for voters to become better informed about the process, issues and candidates in the municipal election. 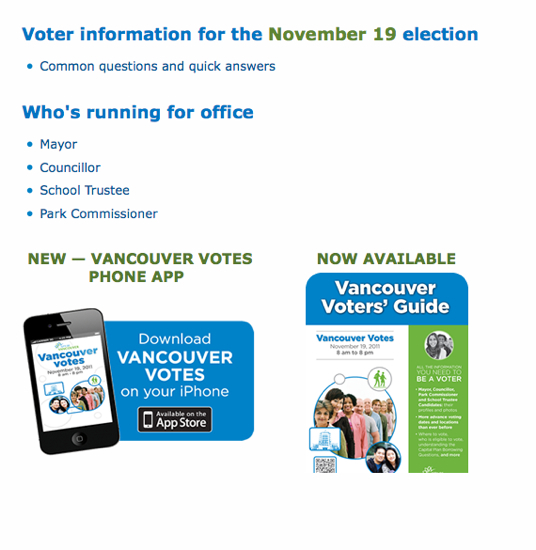 The city of Vancouver has introduced a new phone application (app) for smarts phones that has a very impressive amount of information at the tip of ones fingers from poll locations, info on the Capital Plan, bio of candidates and even a little quiz on civic issues in Vancouver. Download the app and become better informed about the election and Vote on November 19, 2011. Lets make voting the majority. Vancouver – COPE City Councilor Ellen Woodsworth and Park Board Candidate Brent Granby are supporting the creation of a permanent farmers’ market infrastructure that would operate throughout the entire year. While farmers’ markets are becoming an ever-popular occurrence in Vancouver neighbourhoods, they are still mostly limited to the fair weather spring and summer months. COPE is supporting the creation of the New City Market, a project that, thanks to a $100,000.00 Vancity grant, has made it to the business planning stage. The New City Market, the brainchild of Vancouver non-profit, Local Food First, would serve three main functions: as a permanent market and storage space for local producers, as an education and community outreach resource as well as a value added food processing location. COPE looks forward to seeing the business plan and financial assessment, and plans on making it’s completion a priority for city council.